Having easy-to-use navigation is important for any web site. With CSS you can transform boring HTML menus into good-looking navigation bars. A navigation bar needs standard HTML as a base. In our examples we will build the navigation bar from a standard HTML list. The code in the example above is the standard code used in both vertical, and horizontal navigation bars. Add text-align:center to <li> or <a> to center the links. Note: This example might not work properly on mobile devices. There are two ways to create a horizontal navigation bar. Using inline or floating list items. Note: Fixed position might not work properly on mobile devices. Use position: sticky; to <li> to create a sticky navbar. A sticky element toggles between relative and fixed, depending on the scroll position. It is positioned relative until a given offset position is met in the viewport - then it "sticks" in place (like position:fixed). Note: Internet Explorer, Edge 15 and earlier versions do not support sticky positioning. Safari requires a -webkit- prefix (see example above). You must also specify at least one of top, right, bottom or left for sticky positioning to work. 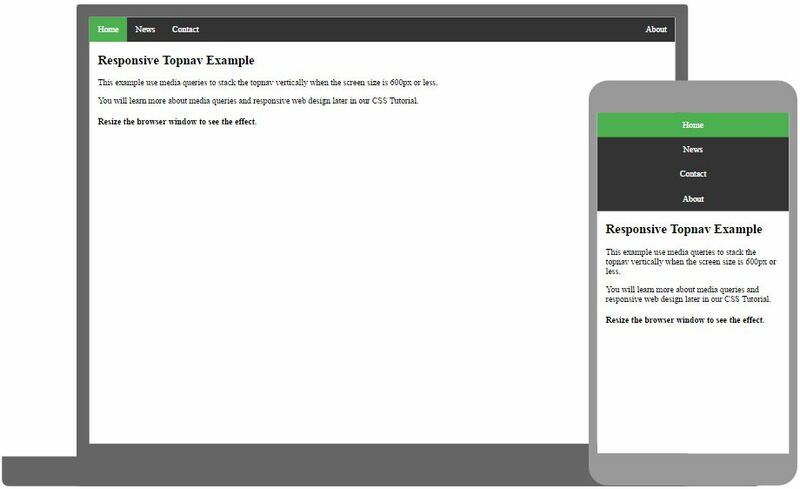 How to use CSS media queries to create a responsive top navigation. How to use CSS media queries to create a responsive side navigation.